Nobody likes a heartbreak, but this is one “Heartbreak” that I knowwwww most women will welcome with open arms! Tres Beau by designer Kimmera Madison released “Heartbreak” on Valentine’s Day. But you can see that this is not a gown that is so Valentine-ish that it can only be worn on February 14th. It looks amazing on any other day of the year! It comes in three colours; red, fuscia and off-white but I chose this fuscia one because it is not easy to find a nice ‘pink’ gown. I think fuscia is a colour that can look very stylish but since it’s a strong colour, if you go in the wrong direction, you can end up looking either too childish, too girly or ‘a bit too much’. If you look closely, the pink used in this gown is not a flat one tone of pink. It’s actually a mix of different tones and that’s what gives this gown a deeper and sophisticated look. I used a multi-pale coloured jewelry set by Kunglers Extra just to break the pink a bit while adding some accent to the otherwise total fuscia look. I also wanted to avoid the look being too girly so I chose to go with a smokey makeup with a slight tint of pink for the eyes and a very pale pink for the lips. Overall, I’m very happy with the result and I think I was able to make the exact look that I was going after. Now I’m happy and I can go back to sipping my favorite coffee! I guess it was my sheer luck that my computer decided to break down in mid-December when I was just getting ready to return back to Second Life. I always wonder why some things just have to happen as if it chose the worst timing ever. 😦 And with the year-end/new year holidays, which is really big in my country, coming up, there was no way I could get my PC back before the new year. So what I’m trying to say is….I missed watching Miss Virtual World last year! But Enzo Champagne of Champagne! 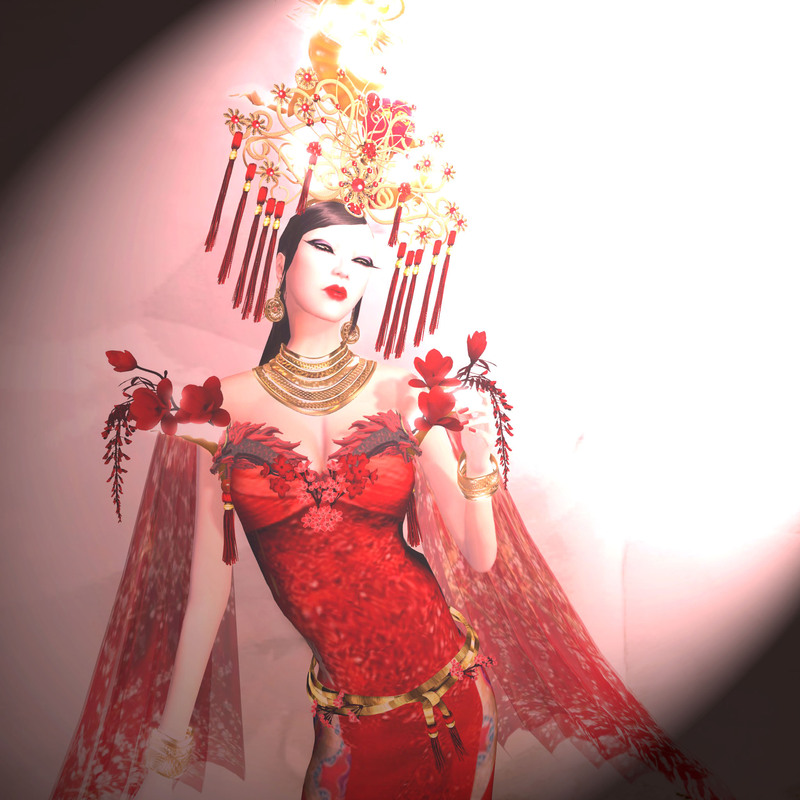 Sparking Couture sent me the amazing gown he created for Miss China 2014 called DRAGON, which was exactly what I needed having just come back and didn’t have time to go shopping yet. Thanks to Enzo, I was able to get right back into modeling mode and totally enjoyed styling this fabulous gown. And a friend Japanese creator, Hays Uriza, made the jewelry set I am wearing. It is a mesh set and comes in gold, silver and copper. I use this set a lot and I never get tired of it because I just love how it’s simple and yet so impressive and creates a dramatic effect. Again, just right for a dramatic gown like this Dragon. I will just add that the necklace can be size adjusted in all 3 dimensions so it is very easy to get a right fit for any size avatar. I don’t have a photo studio yet so I decided to take a stroll in the beautiful Angel Manor Estate sims and take location shots. This is a dress that is so elegant and delicate that I almost feel like I am wearing a dress made of feathers. The vertical lines of this dress give it the simplicity that I like too. I have mood swings when it comes to fashion and this couple of days, I’ve been extremely attracted to elegant dresses that are simple and don’t come with many parts or components. The same goes for makeup. Lately, I am not in the mood to wear lots of strong colours so here, I kept my makeup very simple too. The skin I am wearing is a new skin from Elysium where creator, Aleida Rhode, made Asian skins for the first time. It captures the essence of Asian features and I absolutely loved it! When I started to model, I searched for Asian skin for a very long time but was never able to find one that I liked…until this one! Congratulations Ale for a great skin launch! *Cosmetic Fair Winter Edition / January 15th – 30th　Only a few days left! Hope for Emilia, held through August 9, is a fundraising event for the victims of the recent earthquake in Emilia, Italy. Many brands have joined in to support this charity project, donating exclusive items that are only sold on this event site with 100% of sales going to charity. 100% of the funds raised with this event will be donated to victims of the earthquake through a an official bank account opened by Emilia-Romagna region and all transactions will be public on the Hope For Emilia website. 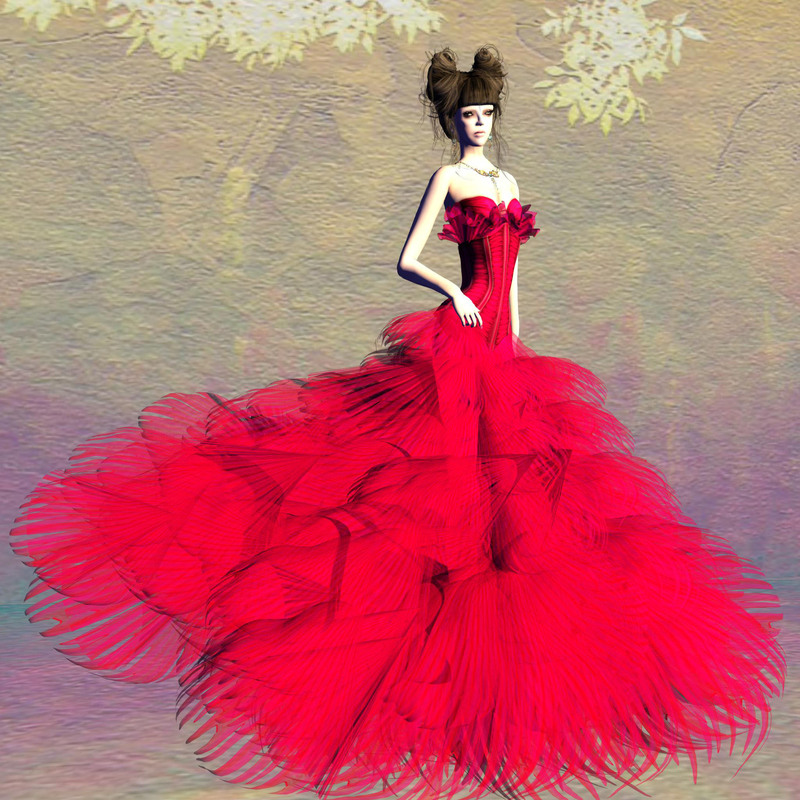 Here, I am introducing this love gown that was released by Fellini Couture as the exclusive item. “Fellini Couture – Tentation W&B Hope For Emilia” is a black & white mesh gown that is chic, elegant and glam! I am also using an exclusive face tattoo released from White Widow. This face tattoo comes in various colours and has the “without eye shadow” versions for each colour. The one I am using here is the “with eye shadow” version. The hat I matched in this styling is one of the new hats released recently from Bliss Couture. Being a passionate animal lover, the bird in the hat was enough to make this one of my favorites. Needless to say, it is stylish too! The jewelry set is a new mesh jewelry that has just been released from Virtual Impressions. At this store, new items are released every Saturday and group members can buy all new releases at 50% discount for the first one week period. So this is one group worth joining if you have group slots you can open up. *The SURL links for the exclusive items above direct you to the respective stores on the event site. Click here to go the central landing point for Hope For Emilia. 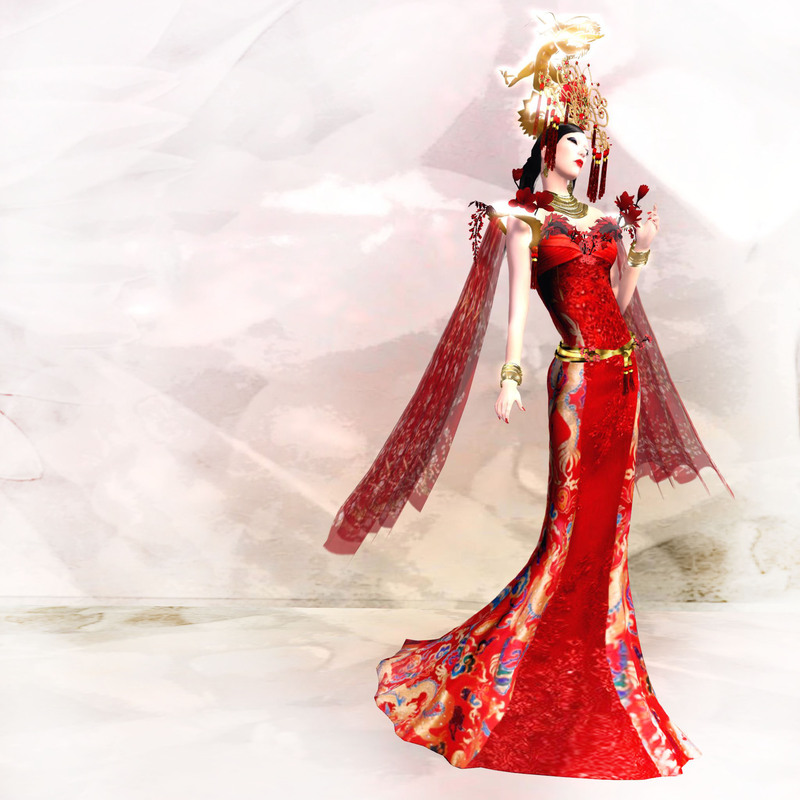 BOSL RFL Sales – 2.5 More Days Left! There is only three days left to buy any of the exclusive items sold with the BOSL RFL campaign. All items are sold in the participating stores as well as the BOSL Mr. Virtual World Theater where the grand final pageant of Mr. Virtual World took place. Each participating brand has given this event one exclusive item that will only be on sale until July 14th, 12 noon and 100% of all sales of these items will be donated to Relay For Life. Today, I am introducing the exclusive mesh dress that was made for this charity event by Zalyn Bailey of VoguE. This is a lovely black and white mesh gown that has sweet fused with chic. Here I did a makeup for a print work, meaning that is good for blog or magazine pics but of course, this gown will look amazing with more realistic makeup. I would wear this with deep red lipstick and maybe just an eye-liner…simple and chic classic makeup. 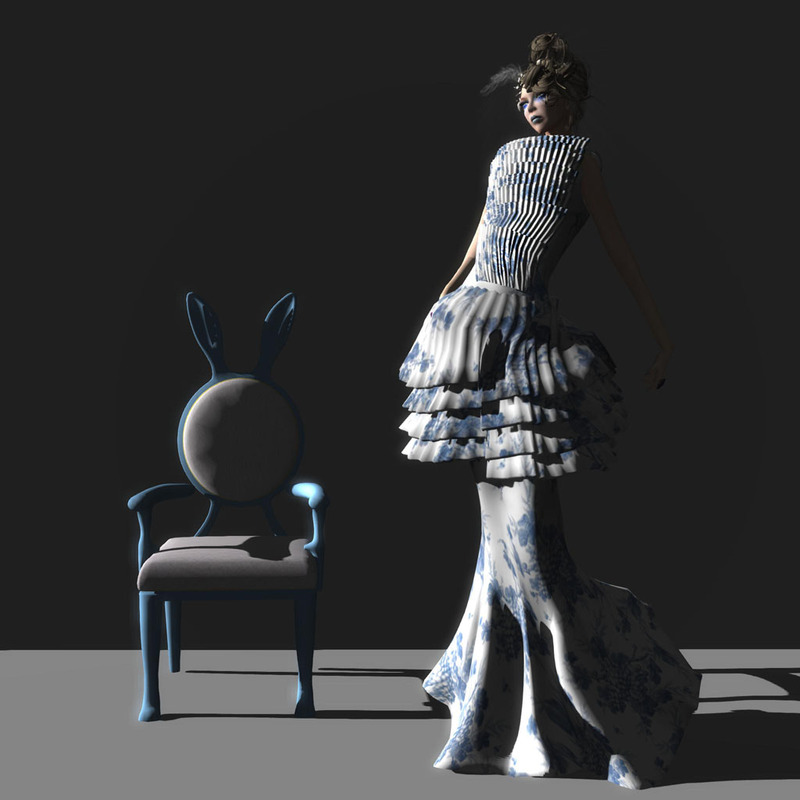 You can also buy all BOSL RFL exclusive items in the Mr. Virtual World Theater where all items are displayed and sold on RFL venders on the back wall. The links below are divided into three locations as each is a different sim.